Ultrasonicated squid ovary powder (USOP) was used to replace egg white powder (EWP) at different substitution levels (12.5–100%) and its effects on properties of batter and cake were investigated. High elastic modulus (G′) and average bubble size of batter added with 100% USOP resulted in higher volume and lower baking loss, when compared to the control cake (100% EWP). For textural analysis, the lowest values of hardness, gumminess and chewiness were noticeable for cake containing 100% USOP. Crust showed the lower moisture content than crumb and bottom part of all the cakes. No difference in moisture content was observed for all parts of the cakes containing 25–100% USOP, while lower moisture content was obtained for cake added with 12.5% USOP and the control. The color difference (ΔE*) between the control and cake added with USOP was increased with increasing USOP levels. When 100% of USOP was added into cake, higher likeness score was obtained for firmness and overall likeness. 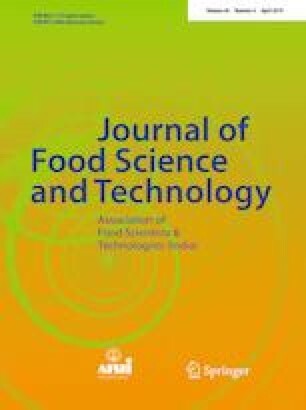 Microstructure study of cake added with 100% USOP revealed that oil phase was distributed in gluten matrix more uniformly, when compared to the control. Thus, replacement of EWP with 100% USOP resulted in the production of cake with superior quality and increased overall acceptance by consumers. This research was supported by the Higher Education Research Promotion and the Thailand’s Education Hub for Southern Region of ASEAN Countries (THE-AC, 2015) scholarship and Graduate School, Prince of Songkla University.